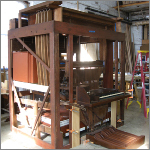 In 2013 we restored the 1 manual, 9 rank 1863 William Stevens organ in the St. Anna's Chapel of St. Paul's Episcopal Church in Newburyport. 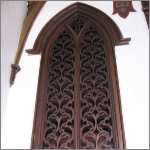 This project was part of a comprehensive restoration of the chapel for its 150th anniversary. The Rev. 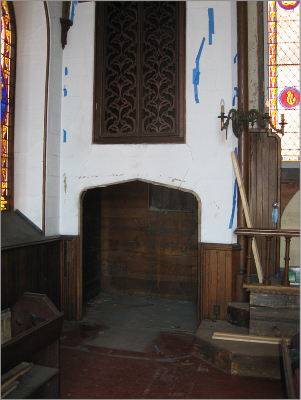 William Horton, rector of St. Paul's from 1853 to 1863, donated this small chapel in memory of his only child, Anna Marie Horton, who died of consumption in 1857 at the age of 25. 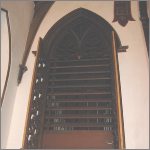 The freestanding Gothic style granite structure was designed by Newburyport architect Rufus Sargent and built in 1862-1863. 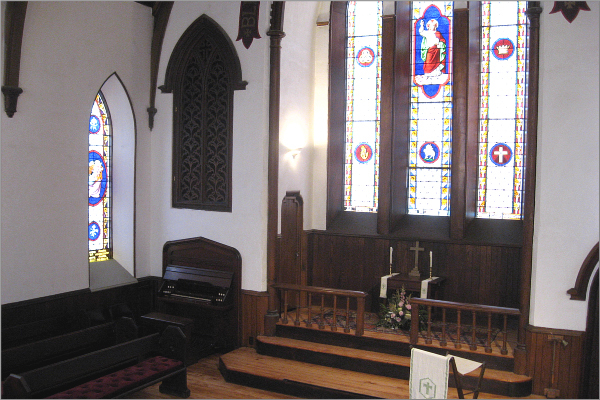 The Chapel is essentially unchanged since its consecration in April 1863, 10 weeks before the Battle of Gettysburg. 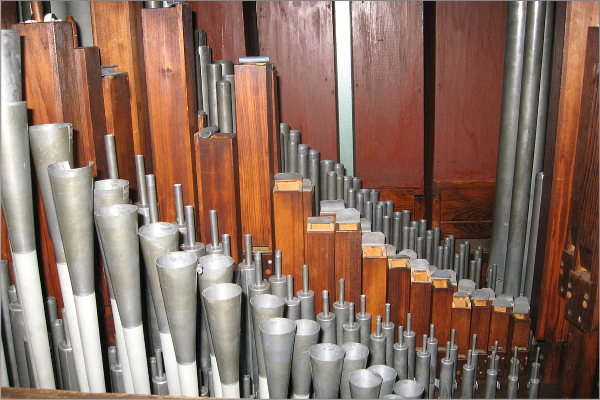 Just like the chapel, the Stevens organ is in remarkably original condition. 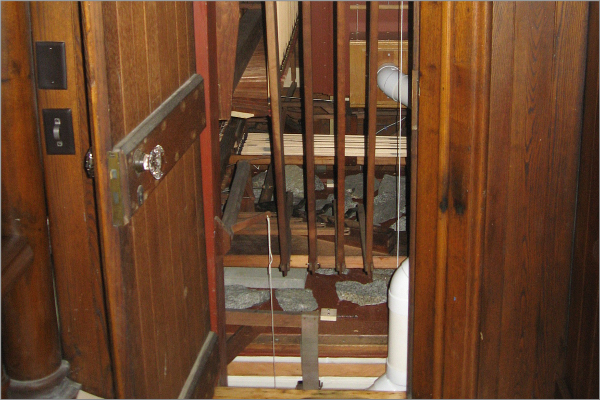 This is mostly due to its inaccessible location. 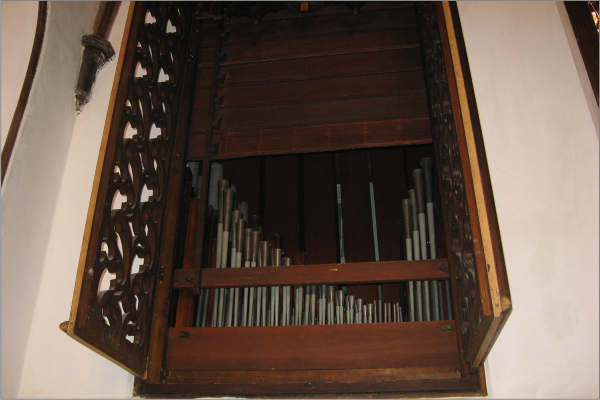 The organ is concealed within a very small chamber at the left of the chancel. Only the console is visible. 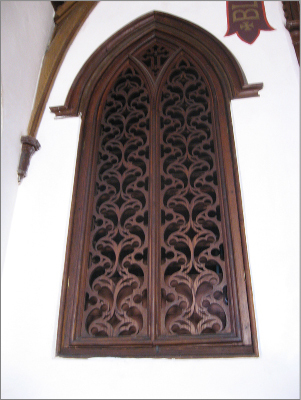 The pipework, all under expression, speaks through a tall and narrow Gothic arch, covered by a wooden grill, above the console. 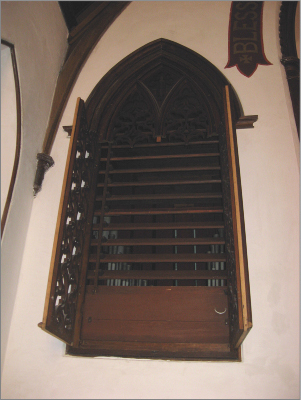 Access into the lower part of the chamber, through a narrow side door in the chancel, is blocked by stop action trundles which must be disconnected to gain entry. 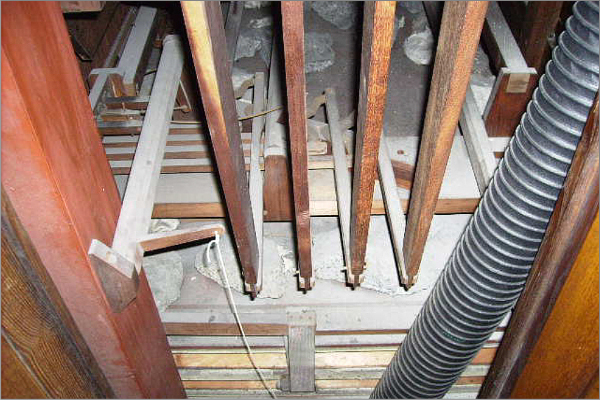 Access to the pipework was, until recently, equally challenging. 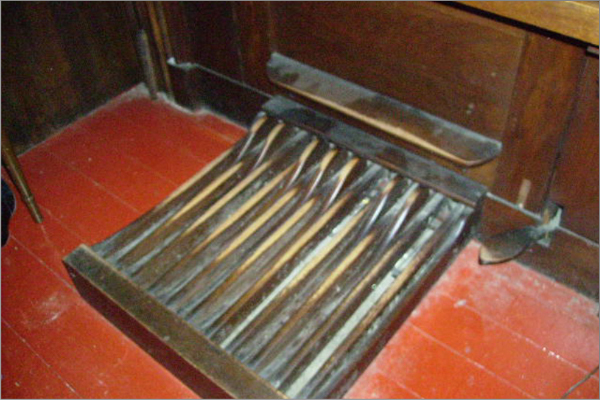 The organ was hand pumped until the 1980s, when OHS founding member Barbara Owen added an electric blower. 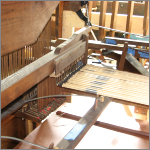 A few years later, Barbara and organbuilder Darren Wissinger cut and hinged the wooden front grill to permit access to the pipes for tuning. 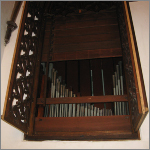 Prior to this, the organ had not been tuned within living memory and many Oboe pipes were choked with dead flies. 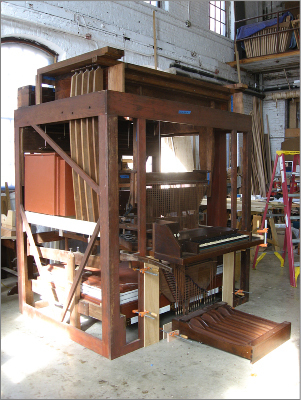 We removed the organ in April 2012, prior to the restoration of the chapel interior. 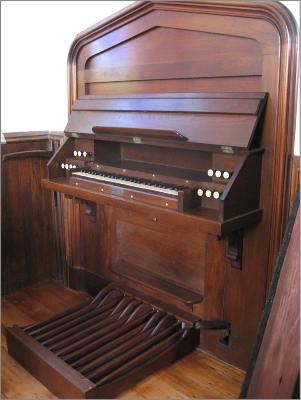 The organ's situation in the chamber was like a ship in a bottle. 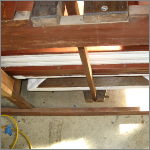 Every large piece had to be disassembled into smaller parts to fit through the small doorway or narrow tone opening. 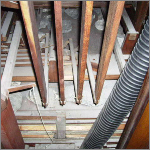 The pipework was still in original condition. 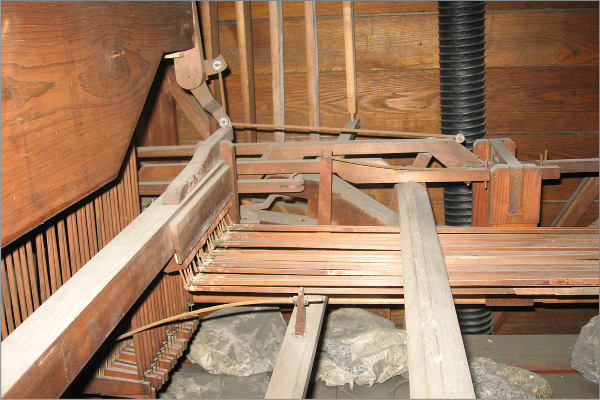 When we removed the granite rock weights on the bellows we discovered that many were still wrapped in newspapers from early 1863. Many of the cloth fiber pages were intact enough to flatten out and read snippets of reports about recent Civil War battles! 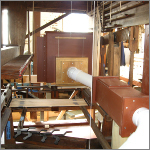 All of the parts were cleaned and restored with historically appropriate materials. 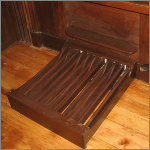 The double rise bellows was releathered, as were its two feeders. 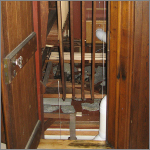 All wood pipes were repaired and their stoppers repacked with new leather. 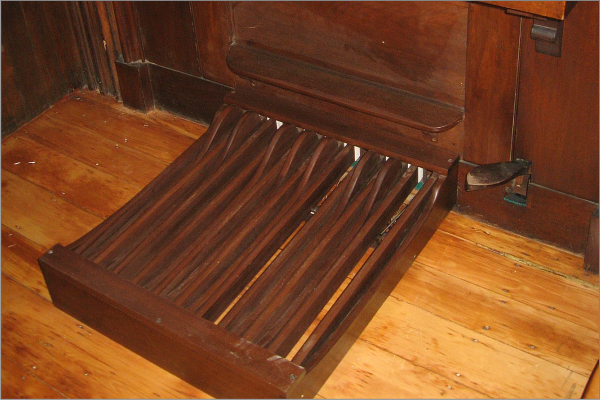 The Honduras mahogany manual windchest table and sliders were in excellent condition and only needed reshimming. 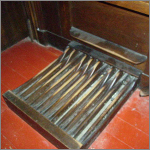 The pedal windchest was repaired. 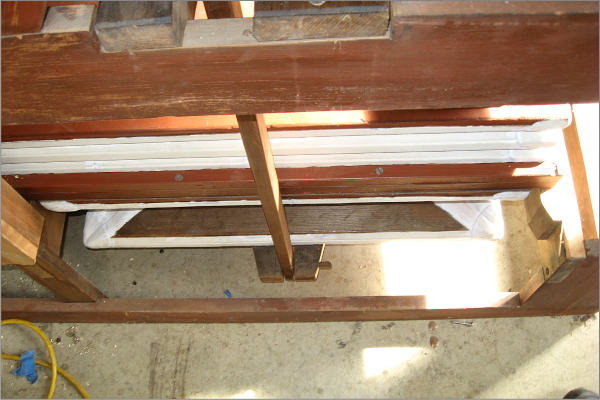 Both windchests received new pallet coverings. 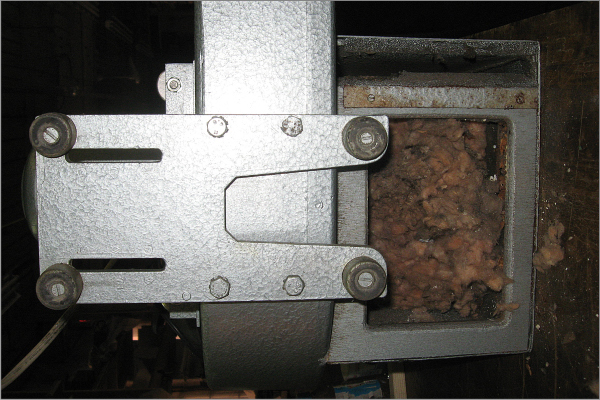 The cone tuned metal pipework was cleaned and repaired. 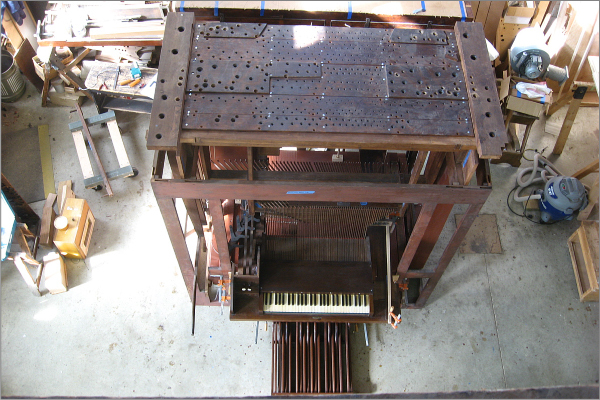 The manual keyboard was cleaned and the 18 note pedalboard was refinished and rebushed. 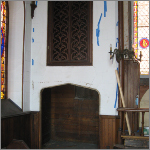 The bench and console surround were repaired and given a new coat of shellac. 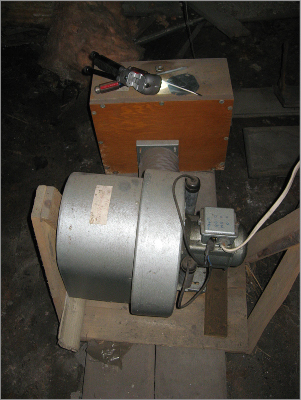 The electric blower, which had been installed in the basement, was covered with mold and rust. 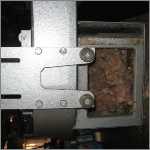 Its intake hood was filled with fiberglass insulation, brought there by mice for a cozy nest. 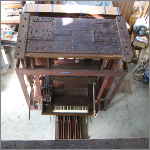 It was disassembled, disinfected, cleaned and repaired. 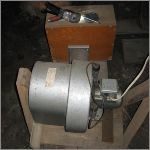 To prevent a reoccurrence, we relocated the blower inside the organ chamber. 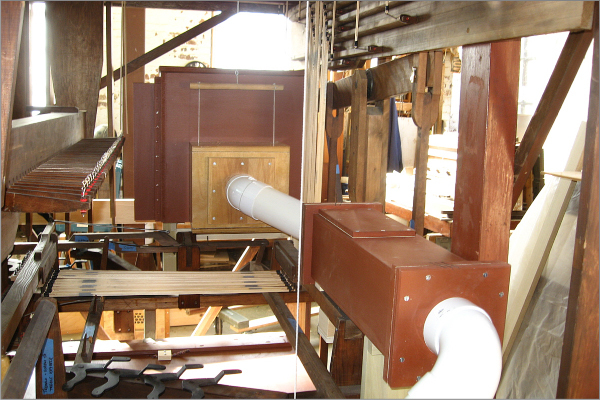 We constructed a silencing box with a mouse-proof intake, and a new curtain valve to regulate the wind supply. 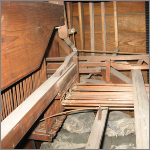 A back check valve in the connecting windline enables the organ to be hand pumped without air leaking through the blower. 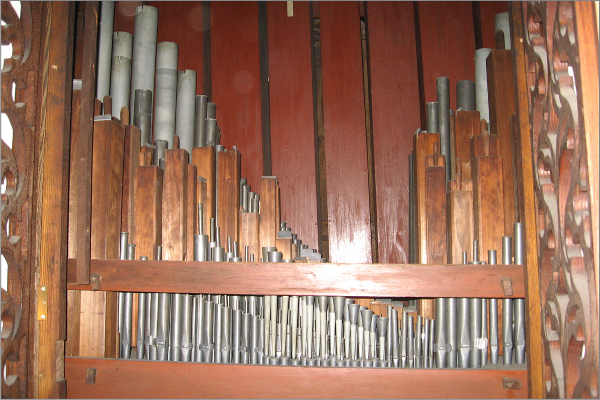 The organ was reinstalled in late September 2013, after the chapel floors were refinished. 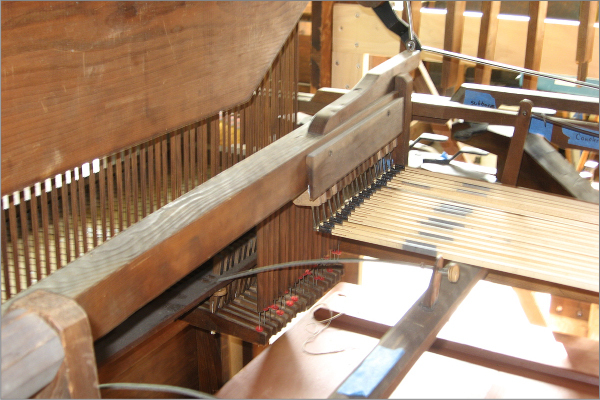 The cone-tuned pipes needed only slight adjustments in their tuning. 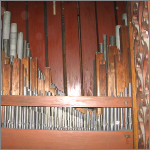 The organ resumed its duties on Christmas Day 2013. 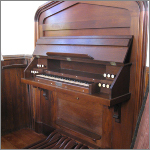 Thus restored, the chapel and its organ will be good for another 150 years! On Sunday, October 5. 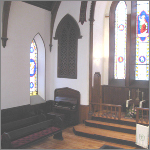 2014, organist Joyce Painter Rice and flautist Martha Woodward played a concert of music for flute and organ to celebrate the organ's restoration. 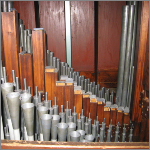 The organ's restoration was partially funded by a grant from the Methuen Festival of Trees, a non-profit which funds historic preservation in the Merrimack River Valley area.